I've seen the new LEGO Friends sets, and wanted to know if the Mini-dolls are compatible in any way with minifigs? I'd quite like to get some sets for the new colours however I want to ensure the accessories, etc. in the set aren't going to be out of scale. The tab that connects the waist to the torso is completely incompatible with any standard System connection I’ve tried. The lack of wrist articulation is extremely limiting in terms of how you can pose them with accessories. The legs have a very slight backward sweep on the way down, which you can see most clearly on the right leg above. The upshot of this is that it is impossible for a mini-doll to stand on any 1×2 area that has anything immediately behind them. 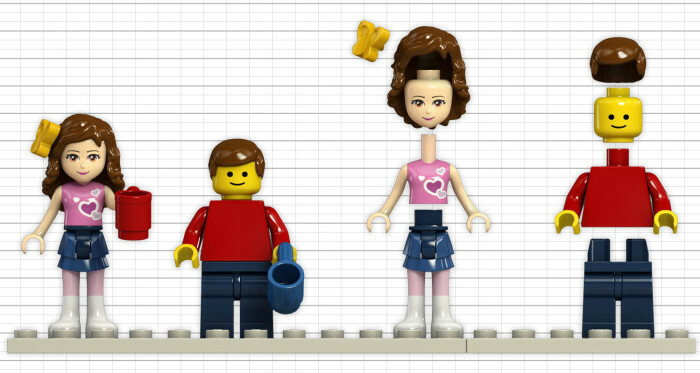 The neck is a standard 3mm bar connection rather than stud-width like a minifig neck–the heads are incompatible with minifig torsos. The head is approximately the same dimensions at the top as a minifig head, but tapers towards the chin in a roughly egg-like way. The hair is interchangeable with minifigs–and many TLC minifig hairpieces look quite good on the girls... it is made out of the same kind of soft plastic as the Exo-Force hair, and has tiny holes on the top and side of the hairpiece that go all the way through, allowing the attachment of hair accessories. Note also that the legs do not move independently of each other - both left and right legs are on the same hinge. Not really a compatibility issue, but it greatly restricts the poses available without modification. It is mentioned in the previous answer that the feet are slightly oblong. I snapped a few photos to illustrate how this impacts the level of compatibility between the two figure types. A standard minifigure will easily be able to 'stand' within a 1 x 2 space. In most cases, this applies to a 'Friend' as well, unless the 1 x 2 space is recessed. The oblong feet make it impossible for the 'Friend' to be used in this way. We see a Minidoll Sweet Mayhem alongside Minifigs of Lucy and Emmet. Not the answer you're looking for? Browse other questions tagged minifigures compatibility friends or ask your own question. How is a LEGO Friends Mini-doll built? What different series are or have there been designed primarly for girls? 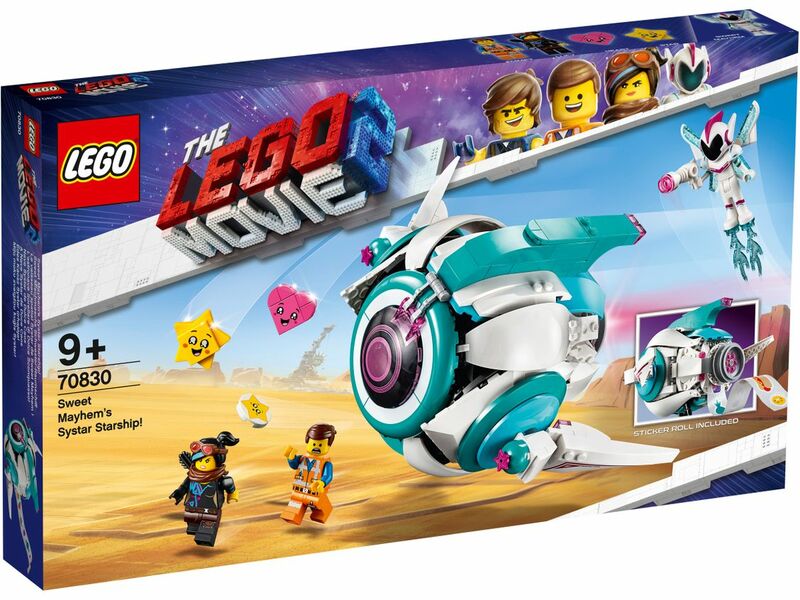 What are the new elements released via the LEGO Friends sets? Are BanBao bricks compatible with Lego? 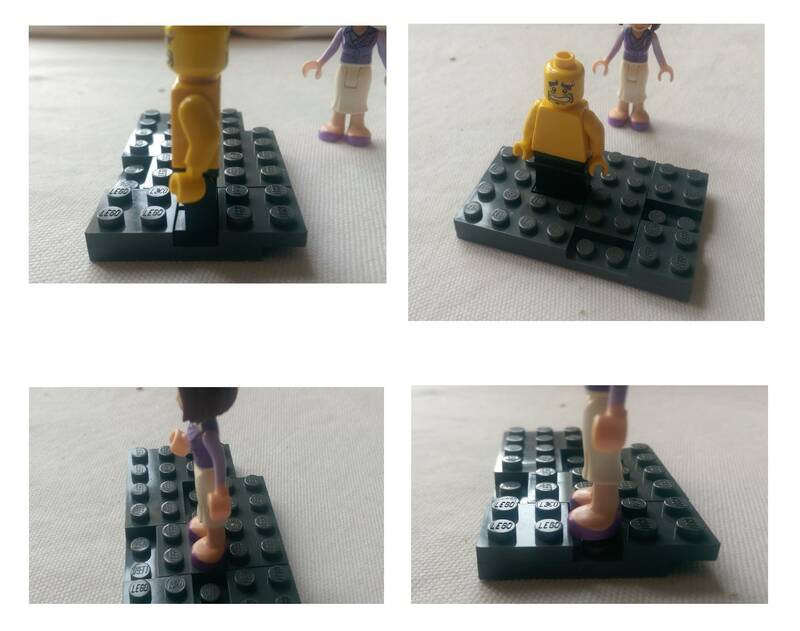 What happened to Olivia in the 2018 Lego Friends sets?